* When your will is in line with Christ, you can accomplish anything. * Spiritual attack is constant and can be deadly. * The enemy will stop at nothing to possess your soul. * Christ the Conqueror is on your side, and with His help, you have nothing to fear! John Bunyan was born in Elstow, England, in November 1628. Two times his life was spared, once when he was in the army and a soldier who took his place in battle was killed, and once when he fell out of a boat and nearly drowned. He believed, and the world can testify to the truth, that God spared his life for a special purpose. A few years after he married his first wife, she died, leaving him with four young children. Four years later, he married his second wife, Elizabeth. By this time, he had published two works and was formally recognized as a preacher. On November 12, 1660, he was scheduled to preach in the little town of Lower Samsell. When he arrived, he was informed that a warrant had been issued for his arrest. Unwilling to denounce his Christian faith and his calling to the ministry, he was imprisoned for twelve years. Among the many writings he published during his imprisonment are The Holy City, Grace Abounding to the Chief of Sinners, and the most famous, The Pilgrim’s Progress. After his release, he continued to write and publish stirring works that have endured through time. Among these classics are The Holy War, Visions of Heaven and Hell, and Journey to Hell: The Life and Death of Mr. Badman. After traveling through a rainstorm in an effort to reconcile a young man and his father, Bunyan died on August 31, 1688, and was buried in Bunhill Fields. Order your copy today. Look it over, scan the chapters, and examine the contents for a full 60 days. If after examining the book you feel that this book will not meet your needs, call us and tell us you’d like to return the book. If you have not written in it, we’ll give you a return authorization number and as soon as we receive the returned book from you, we’ll quickly refund your money (less the shipping cost). You may return most new, unopened items within 30 days of delivery for a full refund minus shipping costs. You are responsible for shipping costs related to sending the returned items back to Above Rubies. We'll pay the return shipping costs IF the return is a result of our error (you received an incorrect or defective item, etc.). 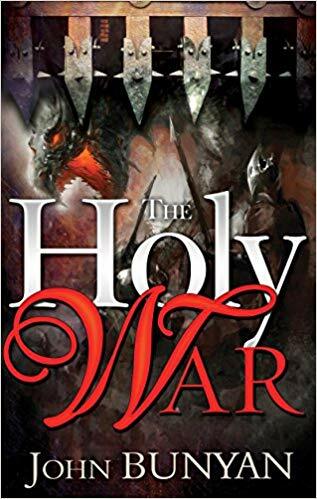 Click the button below to add the The Holy War – John Bunyan to your wish list.